MSC Industrial Direct gives results early in earnings season. 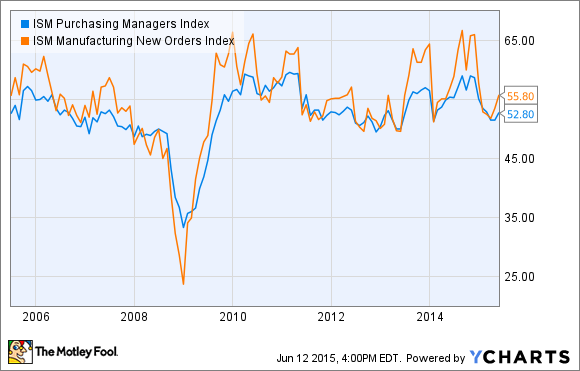 Here is what to expect and why it matters to the U.S. manufacturing sector. MSC Industrial Direct (NYSE:MSM) gives its next earnings results on July 7, and what its management has to say about the industrial sector could set the tone for the forthcoming earnings season. This year has been tough on the company, but there is cause for optimism ahead of its fiscal third-quarter results. Let's look at what MSC Industrial investors and the market should look for in the earnings report. The industrial supply companies are always interesting to listen to because they have very short sales cycles. For example, MSC Industrial sells products such as cutting and electrical tools to manufacturers.They are the sort of products that, in some cases, can be ordered in the morning and delivered by the evening. In addition, theses sorts of tools and products tend to be used more when production is in full swing. Therefore management's earnings commentary will often reflect current conditions in the industrial sector. Of course, short sales cycles also mean limited visibility, so it's hard to know what it will report. With that said, there are a few positive signs going into the earnings. The most widely followed indicator of the manufacturing industry is the Institute for Supply Management's Purchasing Managers Index, or PMI, in which a reading above 50 indicates expansion. As the chart below demonstrates, growth slowed markedly early in 2015, but has bounced back in recent months. Moreover, the new orders component is indicating a pickup in growth. If the data from the PMI is accurate, then MSC Industrial's management should report some improved market conditions. That would be good news for MSC investors, because it's been a disappointing year so far. In a nutshell, the company missed analyst estimates for revenue and sales in its first and second quarters. It gets worse. In releasing its first-quarter results, management gave some positive commentary on the outlook for the second quarter. Fast-forward to the results, and not only did conditions not get better, they actually got worse. In the second-quarter results presentation, CFO Jeff Kaczka predicted that gross margin would be sequentially stable in the third quarter. So far in 2015, MSC Industrial's growth has been heavily weighted toward its large accounts (which tend to have lower margins), and this has helped suppress margin growth. Will it continue? The fall in energy prices hit its oil- and gas-related customers more than management had anticipated in the second quarter. Is it due to bounce back? Sales growth from its manufacturing customers (representing about 70% of its sales) has been notably lower than growth from its nonmanufacturing customers. Will its manufacturing customers start ordering more? Clearly, if the ISM data is a useful indicator, then management should deliver a more upbeat tone in the forthcoming earnings presentations. Similarly, its small-account customers could bounce back if overall growth in the manufacturing sector improves. Of course, investors should never lose sight of the bigger picture, and MSC Industrial is on a long-term quest to consolidate a highly fragmented industry. At a recent William Blair & Co. conference, CEO Erik Gershwind outlined that the top 50 distributors only have a 30% share of the U.S. market -- so there is plenty of opportunity for growth by consolidating the industry. Moreover, Gershwind noted that increased investments in expanding the company's infrastructure (to take advantage of consolidation opportunities) had negatively affected operating margin in the last few years. 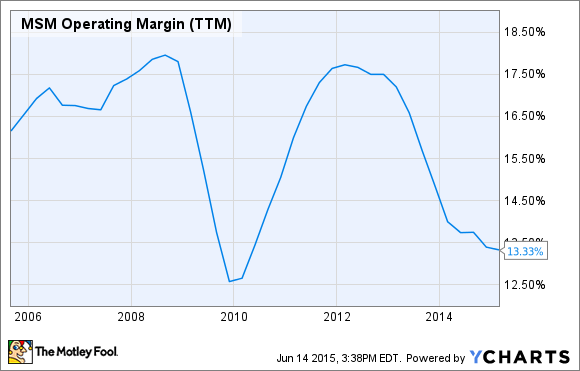 With this in mind, investors should look for any commentary on future operating margins. All told, investors in the industrial sector should listen carefully to what MSC Industrial's management says about market conditions -- it's usually a good marker for how the earnings season will go for the companies exposed to U.S. manufacturing. On a company-specific basis, it would be good to see more growth from MSC Industrial's small accounts, a stabilization in its gross margin, and some positive commentary on future movements in operating margin. This has been a tough year for MSC Industrial, but if the ISM data keeps bouncing back, then conditions could easily get better in due course.